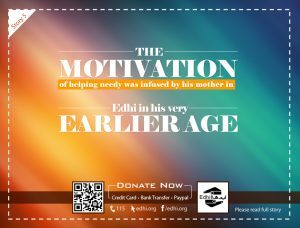 Bilal – the grandson of Edhi, usually waking him up in the morning, having his breakfast with the granddad, on many occasions he was going with him everywhere, and sometime he shares the stale food of his granddad and asks. Granddad! Why you are eating the stale food, are you poor? On this Edhi replied to him. No my sweet grandson! That isn’t the case basically I am remembering my past poverty. In this saga, there is a lesson for others, Edhi despite having a world level name and fame, he prefers eating the stale food, with a broader vision – not to disregard his past, and he may not feel proud for his global popularity, world-class respect and esteem he has earned by receiving massive national and international awards, for his outstanding services he has and currently is rendering to our nation and country, as well as for the humanity. This is the attribute of virtuous people. 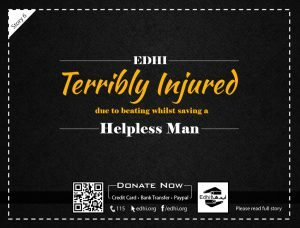 From this tale, it proved that Edhi isn’t only a social worker and a philanthropist, his life is filled with the stories of his virtuous deeds as well!!! Great Edhi Sahib, you are truly great!! !